An Italian paperback edition published in 1983 and translated by Walter Molon. The cover is a striking yellow with red bands framing an inset illustration of an artist's rendering of a shirtless Native American holding a bow. 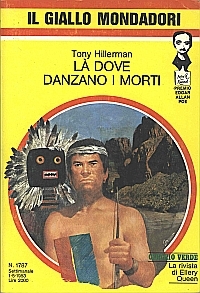 To the left of this figure floats the kachina mask invented for the cover art of the first hardback edition of Dance Hall of the Dead, published in 1973. The cover designer is Carlo Jacono. In the upper right corner the icon of the Mystery Writers of America Edgar Award. The text is set in a two-column format and includes a full-page map showing the proximity of the Navajo, Hopi, Zuni, and Apache reservations. Binding: Paperback with full color front and back covers and black and white advertisements on inner covers.